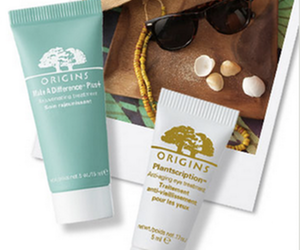 Right now, Origins is offering a Free Deluxe Duo Moisturizing Gift Set with Purchase! 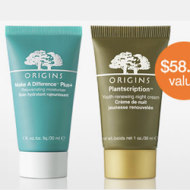 Spend $30 or more and you’ll get this gift including Make a Difference Plus+ rejuvenating cream and Plantscription anti aging cream (a $26 value). You’ll also qualify for Free Shipping. Just enter the promo code below at checkout. 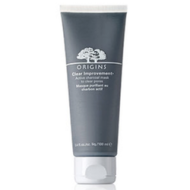 If you really want to stock up on your summer and fall skin care essentials, purchase $50 or more and Origins will Upgrade your Free Gift. The upgraded gift includes a 6-week supply of drink up mask in addition to the duo. Just click the button below to get the promo code. This offer is available until July 29th or until supplies last, so stock up on your favorite skin care products now!